To change the layout and settings of the timeline right click the timeline and choose the ‘change timeline’ option in the menu or click the ‘schedule settings’ button in the button bar. Depending on the schedule type you can turn the different elements in the timeline on or off. At least one element must be visible. When selected todays date is shown in orange instead of black like the rest of the days. You can also include or exclude week days. You can choose to shade these days or to not display them at all. In the standard schedule Saturday and Sunday are turned off. You can hide the weekend days. This makes sense when you don’t want to include them in your chart. When you do want to include the weekend days in your chart it’s best to shade them. This way you can easily distinguish the weekend days from the week days. In Europe, Asia and Oceania this is usualy Monday. In North America, China Africa and Latin America this is usualy Sunday. In most of the middle east this is usualy on Saturday. 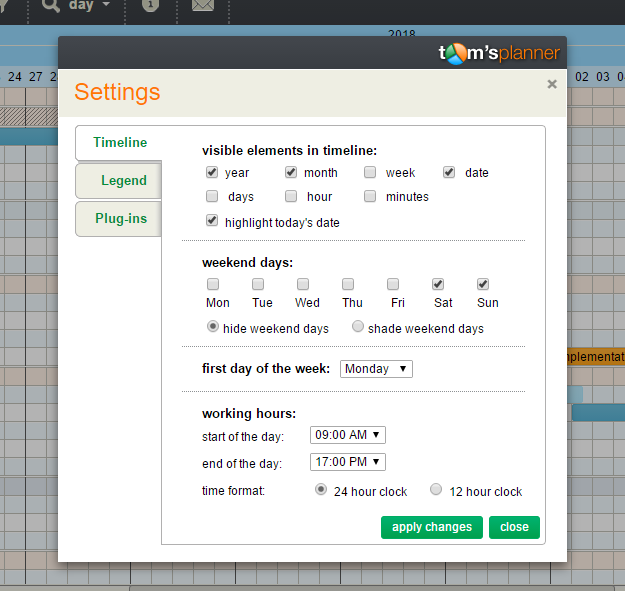 When you have an hour or 15/10/5 minutes schedule you can set the hours of a day . It is not possible to define two time blocks per day (for instance when a workday is split in two by a break or intermission).